David Bowie’s preoccupation with the power of media finds performative expression in much early work (October, 2015). When he saw A Clockwork Orange (1971) with guitarist Mick Ronson in January 1972, the film influenced the final tracking for the album including ‘Suffragette City’ (1972) and the droog-styling of the character Ziggy Stardust, outfits Bowie described as a “terrorist we-are-ready-for-action look” (O’Leary 2015, p. 230). The nadsat dialect shows the continued influence of the film as late as ‘Girl Loves Me’ (Blackstar 2016). As an arts student, and advertising apprentice, Bowie explored media effects through his interest in Marshall McLuhan and celebrity 1960’s writers such as R.D. Laing and Julian Jaynes. Following McLuhan’s mariner in studying the vortex to understand and survive the tempest, Bowie insists, “The media should be used. You can't let it use you” (Crowe 1976). In Nicholas Roeg’s 1976 film The Man Who Fell to Earth, the Bowie-styled protagonist surfs television for information and identity, but echoing Alex DeLarge’s vulnerable subjectivity and brainwashing through the ‘Ludivico Technique’, complains “get out of my mind, all of you” (October, 2015). Alex’s beloved “Ludvig Van” (Beethoven), reconnects the musician Bowie to the fragile relationship between producer and user, while Bowie’s thesis on media switches between the ‘transmission model of communication’ (Grossberg et al 2006, p. 19) and extolling the power of the audience (interview with Newsnight’s Jeremy Paxman, BBC2, December 3rd 1999). 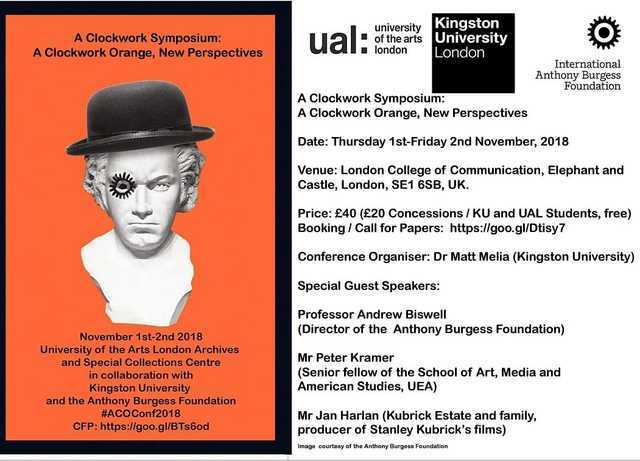 This paper explores Bowie’s creative relationship with such themes in A Clockwork Orange focusing on his early work on vinyl, film and also public forums (music magazines and chat shows). I particularly ask about Bowie’s agency as medium, a conceit made possible via McLuhan’s claim that the medium is the message (1999) and Bowie’s own suggestion that he ‘is the medium for a conglomerate of statements and illusions’ (cited Hauptfuhrer 1976).